Albers eventually decided to attend art school, even though the challenges for art students were often great and the living conditions harsh. Such a lifestyle sharply contrasted the affluent and comfortable living that she had been used to. She attended the Kunstgewerbeschule in Hamburg for only two months in 1919, then in April 1922 began her studies at the Bauhaus at Weimar. At the Bauhaus she began her first year under Georg Muche and then Johannes Itten. Women were barred from certain disciplines taught at the school and during her second year, unable to get into a glass workshop with future husband Josef Albers, Albers deferred reluctantly to weaving, the only workshop available to women. With her instructor Gunta Stölzl, however, Albers soon learned to appreciate the challenges of tactile construction and began producing geometric designs. In her writing, titled Material as Metaphor, Albers mentions her Bauhaus beginnings: "In my case it was threads that caught me, really against my will. To work with threads seemed sissy to me. I wanted something to be conquered. But circumstances held me to threads and they won me over." In 1925, Anni and Josef Albers, the latter having rapidly become a "Junior Master" at the Bauhaus, were married. The school moved to Dessau in 1926, and a new focus on production rather than craft at the Bauhaus prompted Albers to develop many functionally unique textiles combining properties of light reflection, sound absorption, durability, and minimized wrinkling and warping tendencies. She had several of her designs published and received contracts for wall hangings. For a time Albers was a student of Paul Klee, and after Gropius left Dessau in 1928 Josef and Anni Albers moved into the teaching quarters next to both the Klees and the Kandinskys. During this time, the Albers began their lifelong habit of traveling extensively: first through Italy, Spain, and the Canary Islands. In 1930, Albers receives her Bauhaus diploma for innovative work: her use of a new material, cellophane, to design a sound-absorbing and light-reflecting wallcovering. When Gunta Stölzl left the Bauhaus in 1931, Anni Albers took over her role as Head of the Weaving Workshop, making her one of the few women to hold such a senior role at the school. The Bauhaus at Dessau was closed in 1932 under pressure from the Nazi party and moved briefly to Berlin, permanently closing a year later in August 1933. Anni and Joseph Albers, who were Jewish, made the move with the Bauhaus to Berlin, but then fled to North Carolina, where they were invited by Philip Johnson to teach at the experimental Black Mountain College, arriving stateside in November 1933. Albers served as an Assistant Professor of Art. The school was focused on "learning by doing" or "hands on learning." In the early 1940's when Albers moved classrooms and the looms were not yet set up, she had her students go outside and find their own weaving materials. This was a basic exercise on material and structure. Albers regularly experimented with different material in her work and this allowed the students to imagine what it might have been like for the ancient weavers. 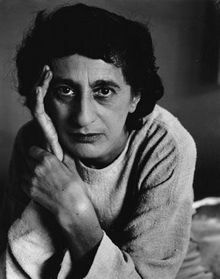 Anni Albers Both taught at Black Mountain until 1949. During these years Anni Albers's design work, including weavings, were shown throughout the US. Albers got her US citizenship in 1937. In 1940 and 1941, Albers co-curated a traveling exhibition on Jewelry from household with one of the Black Mountain Students, Alex Reed, that opened in the Willard Gallery in New York City. In 1949, Anni Albers became the first textile designer to have a solo exhibition at the Museum of Modern Art in New York City. Albers's design exhibition at MoMA began in the fall and then toured the US from 1951 until 1953, establishing her as one of the most important designers of the day. During these years, she also made many trips to Mexico and throughout the Americas, and became an avid collector of pre-Columbian artwork. After leaving Black Mountain in 1949, Anni moved with her husband to Connecticut, and set up a studio in her home. After being commissioned by Gropius to design a variety of bedspreads and other textiles for Harvard, and following the MoMA exhibition, Albers spent the 1950s working on mass-producible fabric patterns, creating the majority of her "pictorial" weavings, and publishing a half-dozen articles and a collection of her writings, On Designing. In 1961, Anni was awarded the Craftmanship Medal by the American Institute of Architects. In 1963, while at the Tamarind Lithography Workshop in Los Angeles with Josef for a lecture of his, Anni Albers was invited to experiment with print media. She grew immediately fond of the technique, and thereafter gave up most of her time to lithography and screen printing. She was invited back as a fellow to Tamarind in 1964. Here she created the six print portfolio titled, Line Involvements. Albers wrote an article for Britannica in 1963, and then expanded on it for her second book, On Weaving, published in 1965. The book was a powerful voice of the midcentury textile design movement in the United States. Her design work and writings on design helped establish Design History as a serious area of academic study. In 1976, Anni Albers had two major exhibitions in Germany, and a handful of exhibitions of her design work, over the next two decades, receiving a half-dozen honorary doctorates and lifetime achievement awards during this time as well, including the second American Craft Council Gold Medal for "uncompromising excellence" in 1981. In 2018, the Tate Modern Museum in London paired with the Kunstsammlung Nordrhein-Westfalen, in Dusseldorf (Germany) for a retrospective exhibition and book of Albers's work. She continued to travel to Latin America and Europe, to design and to make prints, and to lecture until her death on May 9, 1994, in Orange, Connecticut. Josef Albers, who had served as the chair of the design department at Yale, after the artists had moved from Black Mountain to Connecticut, in 1949, had predeceased her in 1976. In 1971, the Albers founded the Josef and Anni Albers Foundation, a not-for-profit organization they hoped would further "the revelation and evocation of vision through art." Today, this organization not only serves as the office Estate of both Josef Albers and Anni Albers, but also supports exhibitions and publications focused on Albers works. The official Foundation building is located in Bethany, Connecticut, and "includes a central research and archival storage center to accommodate the Foundation's art collections, library and archives, and offices, as well as residence studios for visiting artists." Albers was inducted into the Connecticut Women's Hall of Fame in 1994. Albers was a designer who worked primarily in textiles and, late in life, with printmaking. She worked with multiple techniques, primarily lithography, embossing, silk-screening, and photo-offset. She produced numerous designs in ink washes for her textiles, and occasionally experimented with jewelry design. Her woven works include many wall hangings, curtains and bedspreads, mounted "pictorial" images, and mass-produced yard material. Her weavings are often constructed of both traditional and industrial materials, not hesitating to combine jute, paper, horse hair, and cellophane. Albers's early works, such as Drapery material (1923–6) and Design for Smyrna Rug (1925), display some of the characteristics that lasted throughout her career, notably her experimentation with colour, shape, scale and rhythm with abstract, crisscrossing geometric patterns. Her work in printmaking was also experimental as she would "print lines multiple times, first positive then negative, [and print] off-register…She would explore the limits and possibilities of her tools." To Albers, "there is no medium that cannot serve art." On Designing. The Pellango Press, New Haven, CT, 1959. Second edition, Wesleyan University Press, Middletown, CT, 1962. First paperback edition, Wesleyan University Press, 1971 (ISBN 0-8195-3024-7). On Weaving. Wesleyan University Press, Middletown, CT, 1965. Albers, Anni, and Gene Baro. Anni Albers. Brooklyn, N.Y. : Brooklyn Museum, Division of Publications and Marketing Services, 1977. ^ "Albers, Anni". Who Was Who in America, 1993-1996, vol. 11. New Providence, N.J.: Marquis Who's Who. 1996. p. 3. ISBN 0-8379-0225-8. ^ a b c d "Anni Albers". National Museum of Women in the Arts. Retrieved 14 October 2018. ^ Albers, Anni (1971). Anni Albers: on designing. Wesleyan University Press. ISBN 0819560197. OCLC 71843650. ^ a b c d e f "Anni Albers", Encyclopedia Britannica, Retrieved online 14 October 2018. ^ "Anni Albers' Fabric of Belief at the Tate". Tablet Magazine. 2018-12-19. Retrieved 2019-03-03. ^ a b Weber, Nicholas Fox; Tabatabai Asbaghi, Pandora (1999). Anni Albers. New York, N.Y.: Guggenheim Museum Publications. p. 154. ISBN 0810969238. OCLC 41713625. ^ Reif, Rita (May 10, 1984). "Anni Albers, 94, Textile Artist And the Widow of Josef Albers". The New York Times. ^ "Anni Albers". AWARE Women artists / Femmes artistes. Retrieved 2019-03-03. ^ Schönfeld, Christiane; Finnan, Carmel, eds. (2006). Practicing modernity : female creativity in the Weimar Republic. Würzburg: Königshausen & Neumann. ISBN 3826032411. OCLC 71336738. ^ "Gunta Stölzl and Anni Albers". The Museum of Modern Art. Retrieved 2019-03-03. ^ Albers, Anni; Danilowitz, Brenda (2000). Anni Albers: selected writings on design. Hanover: University Press of New England. ISBN 0819564478. OCLC 44650776. ^ Weber, Nicholas Fox; Jacob, Mary Jane; Field, Richard S. (1985). The woven and graphic art of Anni Albers. Washington, D.C.: Smithsonian Institution Press. ISBN 0874749786. OCLC 11650684. ^ Weber, Nicholas Fox (28 October 2013). "'He lived on another sphere, and made most people feel too normal, less poetic than he was'". www.tate.org.uk. Retrieved 2019-03-03. ^ "After 1933 - Bauhaus-Archiv | Museum für Gestaltung, Berlin". www.bauhaus.de. Retrieved 2019-03-03. ^ a b Coxon, Ann; Fer, Briony; Müller-Schareck, Maria, eds. (2018). Anni Albers. New Haven, Connecticut: Yale University Press. ISBN 9780300237252. OCLC 1026344189. ^ Albers, Anni; Bernal, Ignacio; Coe, Michael Douglas; Hill, John T (1970). Pre-Columbian Mexican miniatures the Josef and Anni Albers collection. New York; Washington: Praeger. OCLC 253845585. ^ "Guggenheim". www.guggenheim-venice.it. Retrieved 2019-03-03. ^ Smith, T'ai (2014). Bauhaus Weaving Theory: From Feminine Craft to Mode of Design. Minneapolis: University of Minnesota Press. p. xiii. ISBN 978-0-8166-8723-7. ^ Fer, Briony (10 October 2018). "Anni Albers: Weaving Magic". Tate. Retrieved 2 March 2019. ^ "ACC Gold Medalists | American Craft Council". American Craft Council. Retrieved 2018-02-22. ^ "Albers, Josef". Benezit Dictionary of Artists. Oxford University Press. doi:10.1093/benz/9780199773787.article.b00002081. Retrieved 2018-02-22. ^ Connecticut Women's Hall of Fame. "Anni Albers Inductee Profile". Retrieved January 25, 2018. ^ a b c Baro, Gene (1977). Anni Albers. Brooklyn, N.Y.: Brooklyn Museum. ISBN 087273062X. OCLC 3630534. ^ "With Verticals, 1946 - Museo Guggenheim Bilbao". Museo Guggenheim Bilbao. Retrieved 2018-10-12. ^ Dickson, Andrew (2018-10-06). "Paul Smith on his muse Anni Albers: 'The rest of us are still struggling to catch up'". The Guardian. Retrieved 2018-10-12. ^ "Anni Albers | Artworks, Exhibitions, Profile & Content". ocula.com. 2019-03-05. Retrieved 2019-03-05. ^ "Anni Albers Solo". The Josef & Anni Albers Foundation. Retrieved March 3, 2019. Anni Albers: Prints and Drawings. University Art Gallery, University of California, 1980. Colburn, Mae (March 16, 2014). "Weaving Outside the Lines". Cooper Hewitt National Design Museum. Troy, Virginia Gardner (2002). Anni Albers and Ancient American Textiles: From Bauhaus to Black Mountain. Ashgate. ISBN 0754605019. OCLC 49640549. Weber, Nicholas Fox (2004). Josef + Anni Albers: designs for living (1st publ. ed.). London: Merrell. ISBN 1858942640.